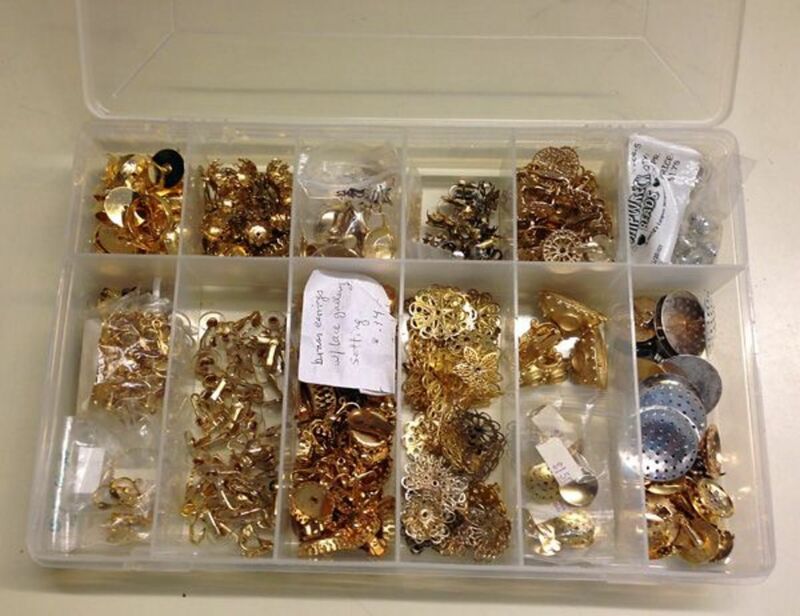 Check out these great storage solutions from a professional jewelry designer! If you love bead stringing for making jewelry, you've probably discovered that collecting beads can be addictive—and that as your bead collection grows, keeping it organized can be a real challenge! As someone who has been designing, creating and selling beaded jewelry for many years I've collected a LOT of beads and jewelry findings. I've also spent a small fortune trying out different bead storage solutions! Now I'm sharing my favorites, so you don't have to. Got a Need for Beads... and a Good Way to Organize Them? As a jewelry designer and avid bead collector, I own literally thousands of beads: vintage beads, Venetian glass beads from Murano, dichroic glass beads, seed beads and Delicas, bugle beads, Magatamas, pressed glass beads, gemstone beads, sterling silver beads, gold-filled beads, contemporary and vintage Swarovski crystal beads, etc. If I hadn't found a bead storage and organization system that not only worked with the way I design jewelry but also that I could maintain easily, I'd never be able to find anything in my collection! I've tried dozens of different storage and organization solutions and some have worked better than others. Over the years I've also had to find new solutions to adapt my storage as my collection has grown. 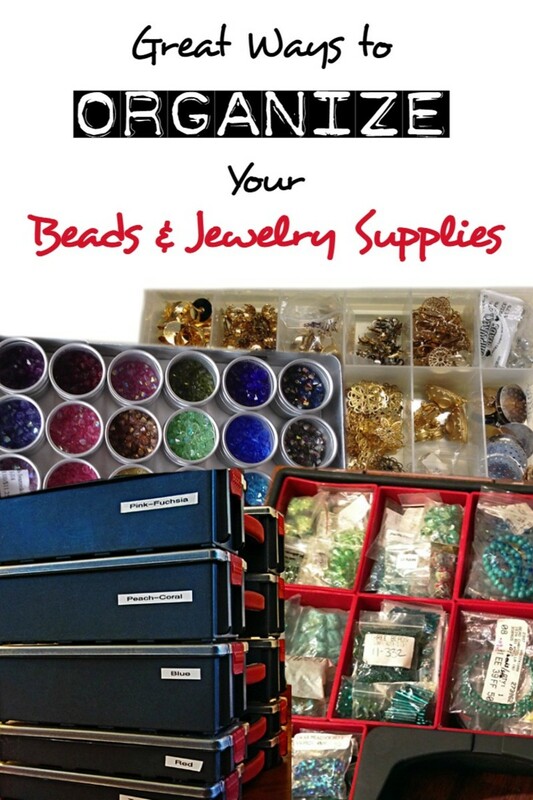 I'm sharing some of my favorite bead storage solutions with you that are suitable for both beginner beaders with small collections and professional jewelry designers with large supplies inventories like mine. I've had mine for so long that some of them have been updated with newer versions or in some cases discontinued, so I've researched for you the closest matches to my bead storage organizers that are currently available. Once you get your beading supplies organized, you'll be able to spend less time looking for what you want and more time designing jewelry. And that's a pretty powerful motivation to get your beads and jewelry making materials organized! Do you have a bead organization and storage system you love, or are you still looking? Have you found the perfect way to store and organize your beads and findings yet? I love my system for storing and organizing my beads and findings (and I'll share it with you in the comments below). My current bead organization system is okay, but not great. I'd love to find one that works better. My current bead storage isn't well organized. I really need to do something about it! I've just started looking at options for organizing and storing my beads and findings. Organization is overrated. I enjoy the challenge of searching for the beads and findings I want to use. Other (please explain in the comments section below). When I first started buying beads and jewelry findings and didn't need the type of large volume storage I do now, I tried out a lot of different types of bead organizers and storage containers. 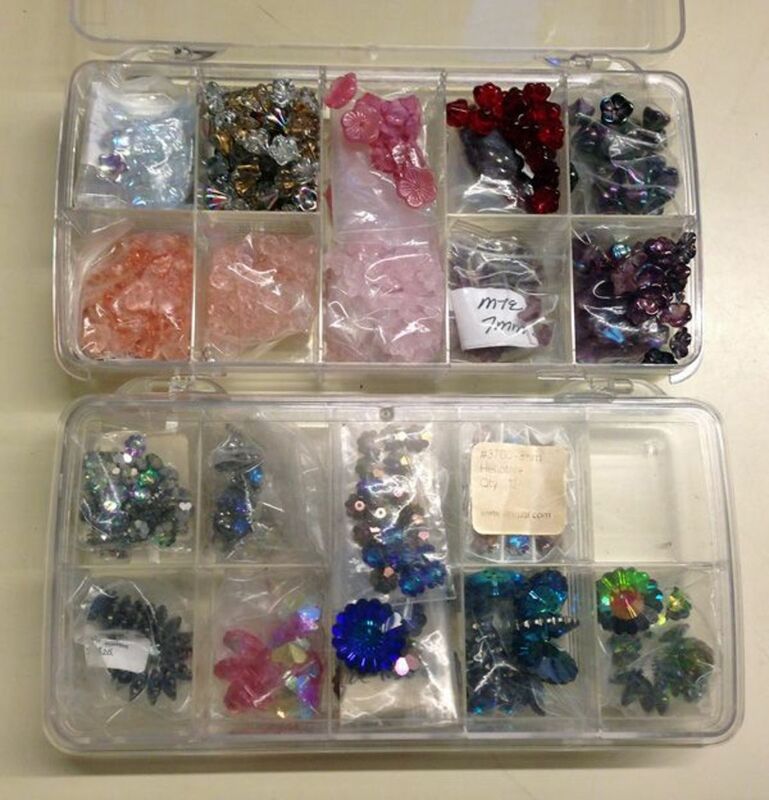 I love the Artbin Prism line of compact storage boxes for organizing small beads and jewelry findings. These hard polystyrene boxes come in different configurations that you can mix and match according to what you need to store. They have flat tops and bottoms so you can stack them easily on a shelf, table or workbench. Best of all, they're crystal clear, so it's easy to see exactly what's in each box even when it's closed. The only drawback to this line is that the containers don't have any type of latch and they open fairly easily, so if you want to carry them around I recommend slipping a wide elastic band around each box (or stack of two boxes). The larger ArtBin 1106AB 6-Compartment Prism Box (11 1/2" x 6 5/8" x 1 3/4" ) has rectangular compartments that are great for organizing and storing headpins and long jewelry findings to be embellished, such as hair pins. This is also a good storage container for large or very long beads that don't fit well in square compartments. Portable fabric tote bags fitted with stacks of bead organizers are extremely convenient, whether you have a small-to-medium size collection of beads and findings, have limited bead storage space, or just like to carry some beads and jewelry findings with you in the car, to classes or beaded jewelry making parties. The ones I own were ArtBin brand and have been discontinued, but Darice makes something very similar. I often use Swarovski crystal 4mm bicone beads in a wide variety of colors to add some sparkle to my beaded jewelry designs. For many years I stored them in shallow aluminum boxes that held small round metal containers with clear see-through lids (see the photo, below). I put one color of crystal bicone bead in each container, and because of the glass lids, I could see which colors were in each container without opening it. The containers, which jewelers often use to store tiny watch parts, are about 1 1/4" wide and about 3/4" tall and they were practically perfect for my purpose. The only downside was that the lids were the lift-off type and didn't fit very securely, which meant I had to be careful not to pick up a container of beads by the lid. In fact, that's the only reason I stopped using them to store my Swarovski crystal bicones. Clear, Screw-Top Containers to the Rescue! Fortunately, you can now purchase small, stackable storage boxes fitted with secure, screw-top containers. Better yet, they also are entirely see-through (not just the lids)! These are available with different numbers of screw-top containers so you can customize your bead storage exactly the way you prefer. They also would be ideal for storing small jewelry findings like crimp beads, bead tips, and jump rings. The SE 87136DB 30-Piece Plastic Screw-Top Container Set in a Clear Storage Box is great for organizing seed beads, findings, even small scrapbooking embellishments. The set includes 30 screw-top containers, each 1" wide x 1 1/16" tall. The see-through storage case that holds them is 6 1/2" long x 5 1/2" wide. 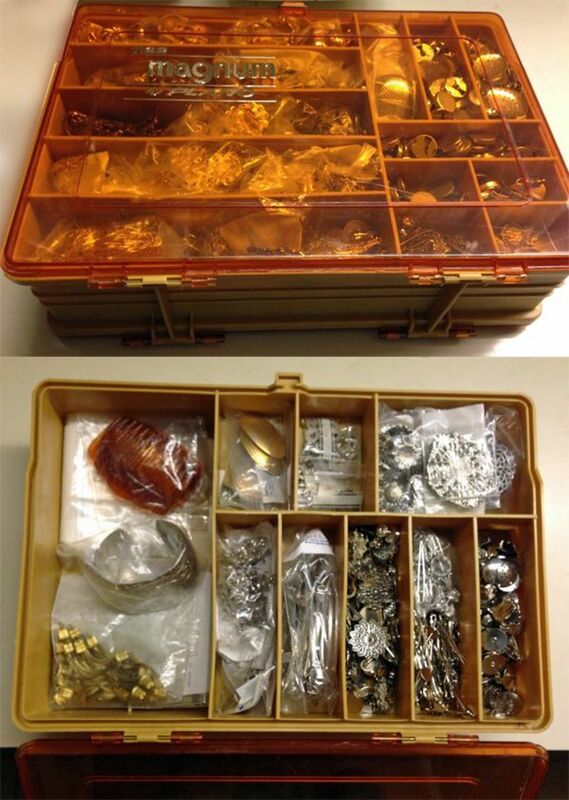 You can stack several of these storage cases neatly to hold all sorts of different jewelry making supplies. 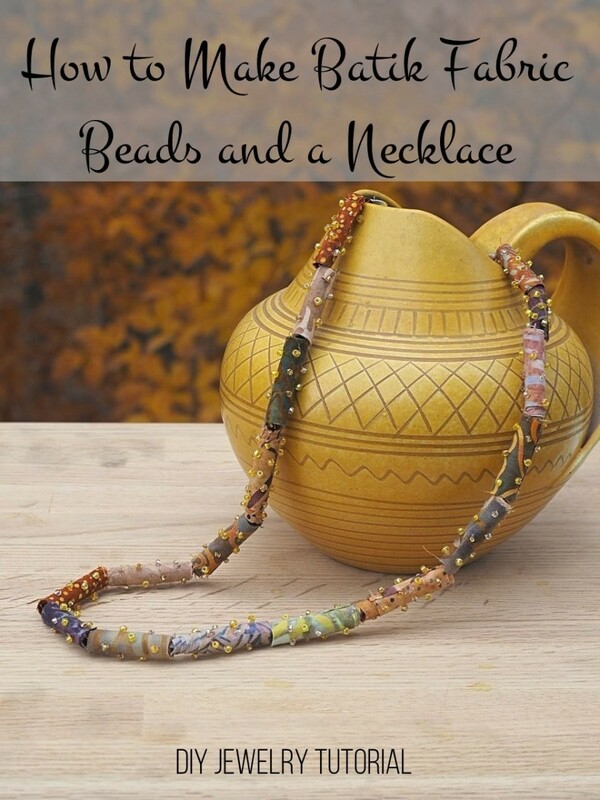 One of the real challenges for any beader is where to put small quantities of beads and findings—seed beads, sequins, odds and ends of leftover beads, and very small jewelry findings such as crimp beads, bead tips, clasps and jump rings. 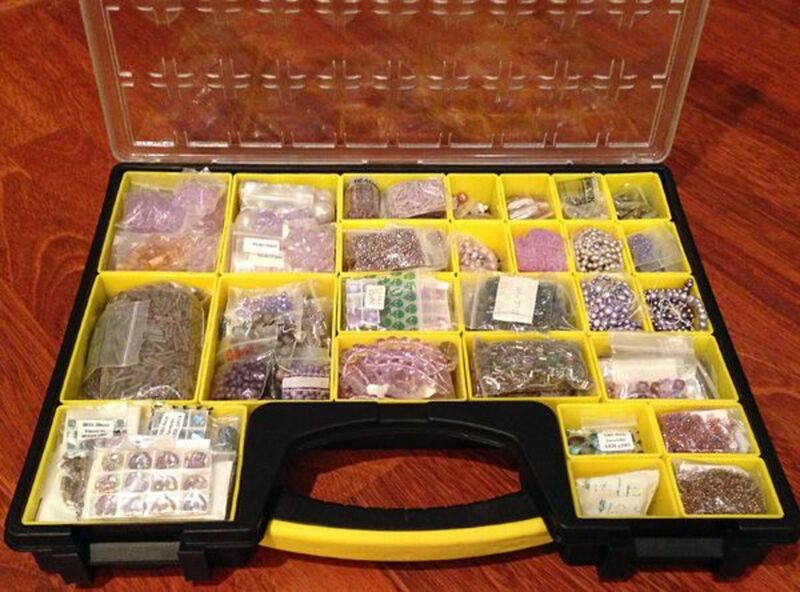 The Darice Jewelry Designer Bead Storage System with 30 containers is a great solution. The see-through jars with screw-on lids are just 7/8" wide x 1" tall, and they stay neat and organized in the clear plastic storage box. Another of the jewelry supplies storage solutions I've tried for small beads and findings is the popular system of small screw-together plastic containers. Small, stacking screw-together containers are handy for carrying around small amounts of beads and jewelry findings securely. I like to put the spacer beads, seed beads and other small beads I'm using for my current beading project into most of the compartments and reserve one to hold the crimps, clasps, jump rings or other jewelry findings for that project so I don't need to clutter my work area with lots of storage containers while I'm working. Unfortunately, there are a number of downsides to using these screw-together container stacks. They don't let you use your limited storage space efficiently. It's also awkward to carry several of them at a time over to your work area. And if you need to take your bead supplies along with you when you go out, the cylinder shape makes them roll around in your tote bag or suitcase. And unless you're storing only a handful of items you'll need a lot of them. They're also easy to knock over on your work table ... and if that happens when one of the compartments is open you're likely to spend the next half hour trying to pick out tiny beads from your carpet! Fortunately, I found a solution: stacking screw-together compartments that come in a handy, flat, rectangular storage box with a secure locking latch. An example is the Darice 2025-252 Bead Container with 28 Storage Jars, a molded case that holds the screw-together compartment stacks horizontally for storage and easy portability. It comes with 28 clear plastic screw-together jars, two that are 1 1/2" deep and 26 that are 1/2" deep. You can stack several of these flat, shallow storage cases on a shelf or table or in a drawer to make better use of your bead storage space. It's a smart, well thought out design. Fishing tackle boxes have lots of compartments and many beaded jewelry makers use them for storing and organizing beads and findings. 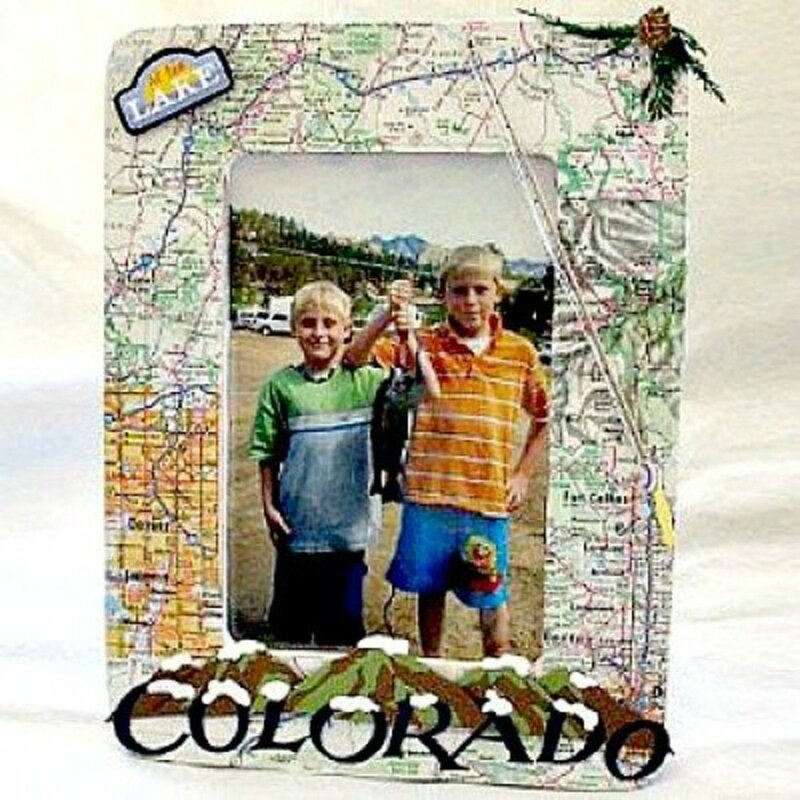 Plano is one of the best-known tackle box manufacturers and their products usually are sturdy and well made. I have several very old Plano double-sided tackle boxes I inherited from my mother, who used to use them to organize some of her embroidery floss and supplies. The photos below show both sides of my largest Plano two-sided tackle box, which I use for storing findings for hair accessories and large vintage findings (mostly clip earrings with attached filigree that use for cagework beadery, and one of the individual utility boxes that I also use for findings. The models I own have been long since discontinued, but Plano offers a large selection of current models to choose from that are even better, featuring secure ProLatch latches and some portable rack storage systems, and they come backed by a limited lifetime warranty, so you know they're built to last. The Plano 1364 4-By Rack System 3650 Size Tackle Box is terrific for organizing a small or medium sized collection of beads and findings. It's designed to be portable, and the best features for bead storage are the carrying handle, the racks that hold four removable organizers with secure latches, and a see-through front cover panel that folds up and locks securely to keep the boxes from sliding out. Each 1.5" deep box comes with dividers that allow you to customize the number and size of compartments, and you can substitute any of the 3600-series utility boxes in different configurations for the 3650 organizers that come with this rack system. And the top compartment underneath the lid is perfect for storing beading wire, bead cord, pliers, crimpers and other jewelry making tools. This portable case lets you can carry your beads, findings, and beading tools and supplies easily wherever you want, from one room to another or to a class, beading party, vacation or other travel destination. There's a much larger audience (read: market) for hardware and small parts organizers than for jewelry makers in general and beaders in specific. That's why some of the best designed, sturdy and sometimes portable storage organizers for beads and findings come from hardware or automotive departments or stores. If you have a small-to-medium size bead collection and a dedicated craft work space where it can live, then one or more small hardware parts units with small pull-out drawers might be just the ticket. These terrific plastic storage cabinets with see-through clear polypropylene drawers are awesome and come in a variety of different drawer configurations, so you can buy one or several and also mix and match the different units for a completely customized bead storage solution. They can stand on a bookcase or other shelf or along the back of your work table against a wall, or they can be wall mounted. And these extremely versatile bead organization and storage units are made in the USA. Here are two of the available configurations I think a lot of jewelry makers will find useful. To see other options, just click on the Amazon link to either of these models and check the additional items under "Frequently Bought Together" and "Customers Who Bought This Item Also Bought." My mom used to keep her beads and jewelry findings in something very similar to this Akro-Mils Hardware and Craft Cabinet. She actually had several of these sturdy plastic storage cabinets lined up against the wall along the back edge of her craft table and dedicated to beads, jewelry findings, sequins, rhinestones, etc. One of the things I really like about this model is that it includes 32 small and 12 medium pull-out drawers. Those 44 sturdy, clear polypropylene pull-out drawers also have convenient finger grips and rear stop tabs to prevent your beads and findings from spilling out. Whether you're a professional jewelry designer, an avid beader or an enthusiastic bead collector, it doesn't take long for your collection of beads to grow so large and eclectic that it takes over your beading space or jewelry making studio—and, in many cases, your whole house! The larger and more varied your bead collection the more challenging it is to organize and store it efficiently so that you can easily see all your choices and access the items you want, or easily find a particular bead or jewelry finding you want or need. After 25 years, my collection is enormous and extremely varied. I haven't yet found a one-size-fits-all storage and organization solution to this challenging problem that won't break the bank, but I have found an affordable storage solution and organization strategy that works well for my enormous and very varied bead collection. 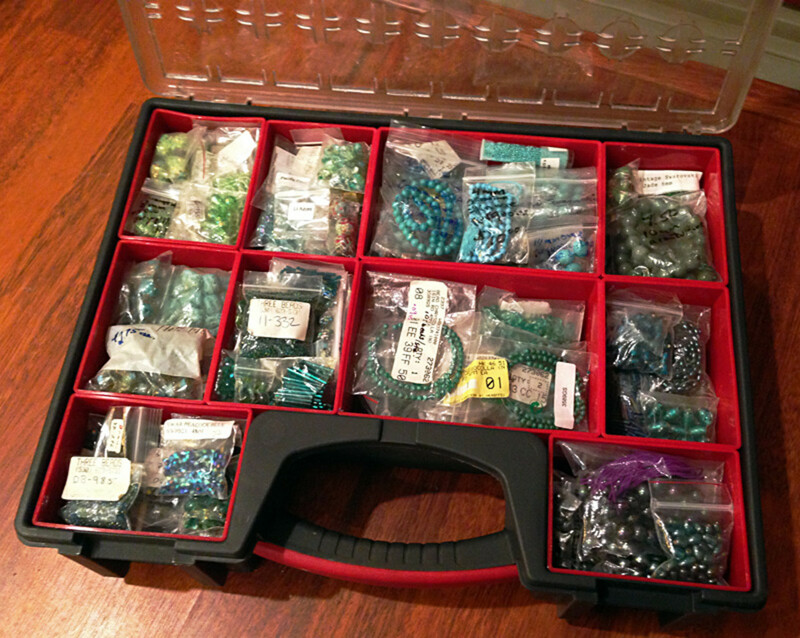 As soon as I started sorting some of my beads, findings, stampings and other jewelry making supplies into the shallow small parts organizer with 25 removable bins, I realized that my husband had found my perfect bead storage solution at last! A small parts organizer is a great way to store and organize large bead collections by color. Here's why these small parts organizers turned out to be the best bead storage and organization solution for my large collection. Removable compartment bins Storage organizers with movable/removable dividers can be handy, since you can customize the sizes of the compartments to suit your needs. They're fine for larger beads, but I've found that small beads tend to slide underneath the dividers and getting mixed up with the beads in the adjacent compartments. But the small parts organizers my husband brought home have removable bins, so the beads stay nicely sorted and organized in their designated compartments. See-through lid The clear polycarbonate lid makes it easy to see the beads inside each case without having to open it. Sturdy, secure latches Nearly every beader has experienced the frustration of accidentally dropping or knocking over a box of beads (why are they almost always tiny seed beads???) and then having to search for and retrieve individually as many of the slippery devils as she can find within an unknown radius of where the container landed. That's why I much prefer bead storage that can be latched securely. The sturdy latches on the Stanley 25-compartment small parts organizer case keep the lid closed until I actively open them. I never have to worry about one of the cases opening unexpectedly while I am carrying it around. I've also accidentally dropped bead-stuffed cases quite a few times they have never come unlatched. A lid that keeps seed beads from "leaking" into adjacent compartments As long as the individual bins are not overfilled, the latched lid stays tight against them so there's no gap at the top for the beads in one compartment to end up in an adjacent compartment when you stand the case upright on edge or carry it around. Comfortable carrying handle The wide, contoured handles are comfortable for carrying and they're molded as an integrated part of each case, so no matter how heavy the organizer is after you've filled it with beads the handle can't ever come loose or tear off. Easily portable and extremely durable These rugged professional organizers are meant to be stacked, schlepped around, and subjected to rough handling. They stand up to abuse far better than any other bead storage boxes I've tried. I tried several different ways of organizing my beads in these cases. Ultimately what has worked best for me is to organize my beads by color families, since sophisticated color combinations are a key aspect of my artistic "voice". The photo above shows how I organize my lavender colored beads. When I have so many beads in a favorite color family that they won't fit into one of the 25-compartment organizers, I use a version with 10 double-deep, removable bin compartments. Since the compartments are too deep to find an individual style of bead easily, I put smaller beads into small zippered plastic bags to sort them within each compartment. At first, I was a bit skeptical about the other organizer my husband brought home, which has 10 larger compartments that are twice as deep as the ones in the 25-bin organizer. But they turned out to be ideal for storing both large beads and large quantities of beads in a single color family. Here is a photo of the case I use for my aqua/blue-green beads. The beads are a bit less accessible in these larger, deeper compartments, so if you don't have a ridiculously large bead collection like mine I recommend sticking with the 25-compartment organizers with the shallow bins. 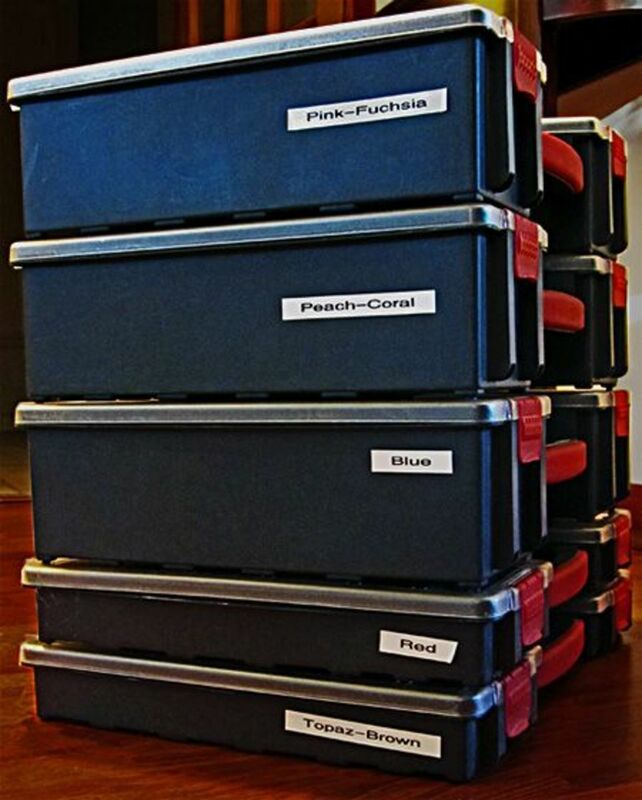 I currently own close to two dozen of these 10- and 25-bin Stanley professional small parts organizer cases—and even more if you count the smaller versions I purchased. Those are half the width of the 25-compartment organizer and I use them to store and organize my art glass focal beads, Bali silver beads, small precious metal beads and jewelry findings—clasps, ear wires, ear posts and ear clips, crimp beads, bead tips, pin backs, etc. Organization, Thy Name is Labeling! No matter what type of storage and organization system you choose for your beads and jewelry findings, labels are your friend. And if you use storage boxes with opaque sides, like the awesome professional small parts organizer cases that house the majority of my bead inventory, they're essential. The following photo shows about 1/4 of my large bead organizer cases, each labeled with the color family or color range of the beads inside. I've labeled both the sides and the bottom of each case, so that whether I stack the organizers on a shelf or stand them up on the floor against the wall, I can easily tell which one has the color I'm looking for. The label maker I use to label my bead storage organizers, jewelry making supplies drawers, etc., is a very old DYMO LabelMaker that I inherited from my mother. Even though it got a lot of use for many years before it came to me, it's still going strong! It's so old that they no longer make the label tapes it uses, and at some point, I'm going to have to replace it when I run out of label tape. When that happens I'll definitely replace my reliable workhorse with another DYMO label maker. When I started looking for a currently available label maker to recommend to you, I was shocked by how much they cost now! Fortunately, I found the DYMO LabelManager 160 hand-held label maker. It doesn't have a lot of fancy bells and whistles, but it makes nice, easy-to-read labels in your choice of several widths and it's refreshingly affordable. And if it lasts even half as long as my mother's DYMO LabelMaker has, you'll have gotten yourself a real steal of a deal. Hi! I’m just beginning to organize my smallish collection. I,too, am organizing by color, which I’m super excited about! I’m using clear containers with removable dividers. How do you add in a new purchase that fits into a color category for which you don’t have an empty compartment? There are several solutions. You can break up the color category into two categories. For example, I have collected a ton of beads in the blue family, so I have organizer cases for light blue, dark blue and turquoise beads. Similarly, I have one for purple beads and another for lavender. Buy larger organizers than you need at the moment. This leaves empty compartments for each color family so you can add new acquisitions. And buy a few extra organizers in case you eventually need to break a color family into subcategories. It’s very helpful to have cases that are all the same size and shape for your main bead collection, since they can stack/store more efficiently. 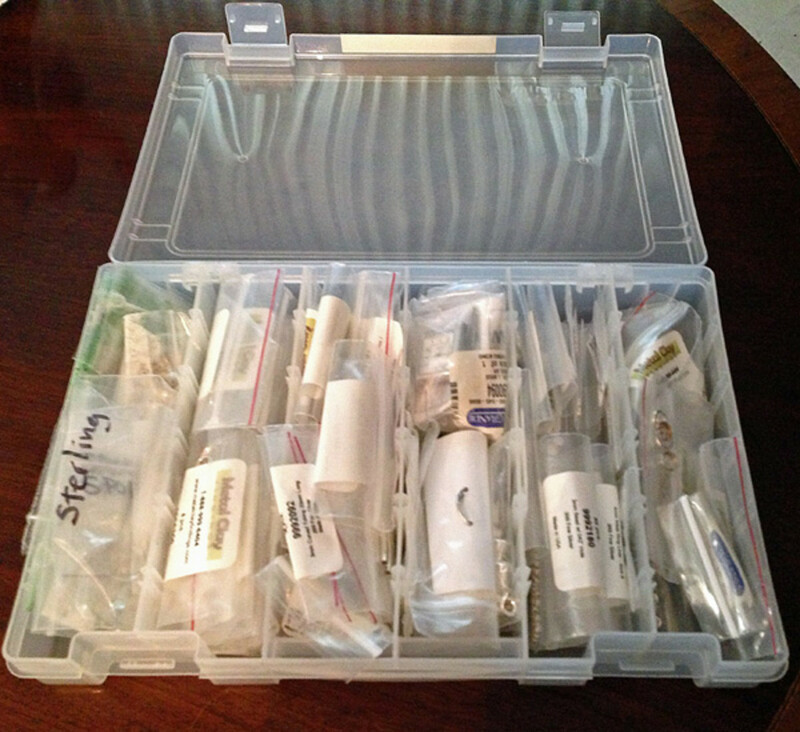 I bought the same small parts organizer cases in two sizes - mostly larger cases but also a few smaller ones that I use for jewelry findings, metal spacer beads and specialty categories (such as special artist-made, one-of-a-kind focal beads). 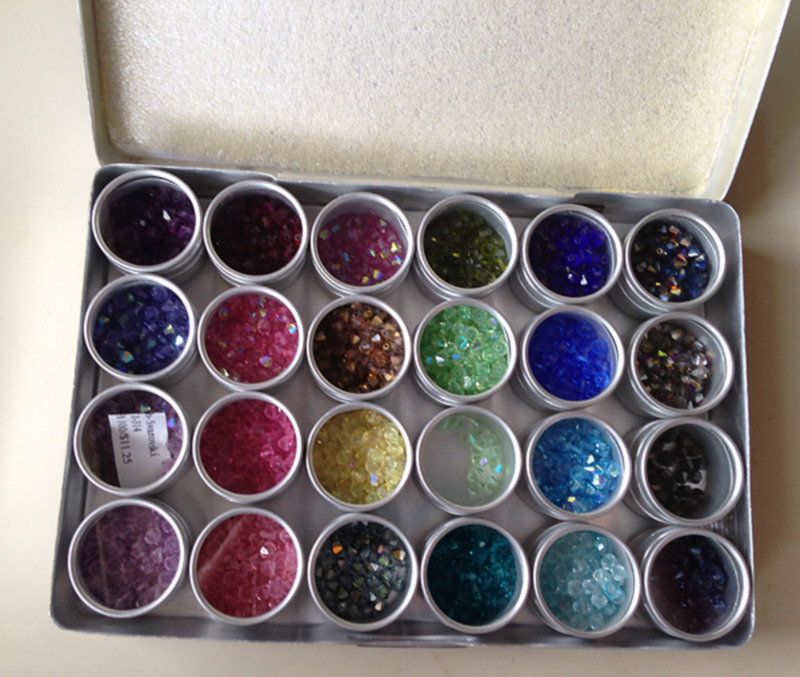 You could also use the smaller ones for color categories in which you don’t currently have a lot of beads and then move up to one of the spare larger cases if your collection for that color outgrows the smaller organizer case. What kind of containers are in the last picture? I think they are blue with red locking tabs. They are actually black with red locking tabs. They were made by ZAG, which has since been purchased by Stanley. The Stanley version of the 10-compartment deep organizer is black with yellow locking tabs and compartments. I provided a link to it in the article. Hope that helps! I'm overwhelmed with findings of this article, and I'm so discouraged looking through so many trays looking for one thing. Is it better to throw away unused beads and jewelry supplies? Should I dump them in a jar and sort out as I need them? I’d spend about the same amount of time looking for them out on a tray, and they would be easier to see. Should I throw them away and purchase new jewelry packs for each client? 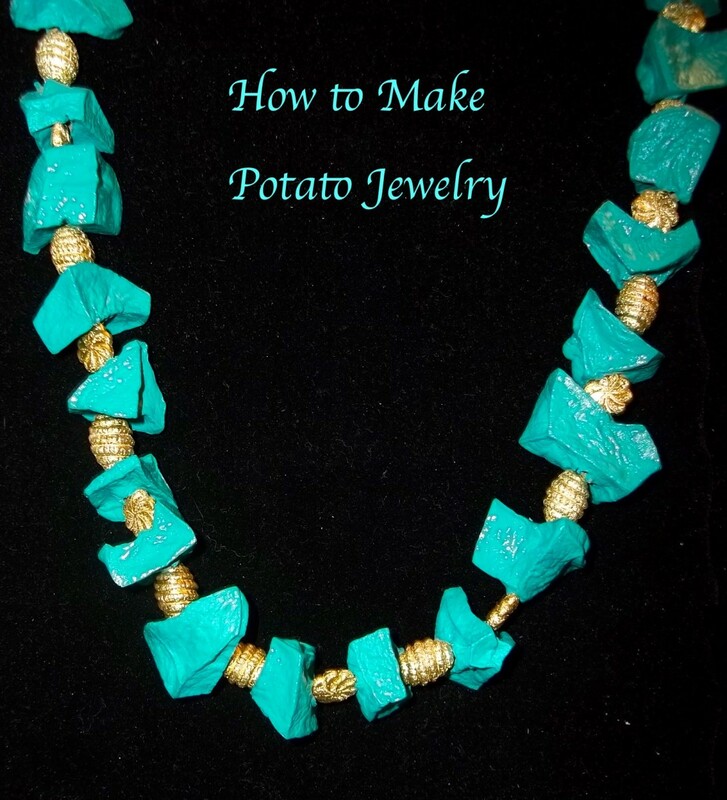 I strongly recommend that you bite the bullet and spend as many hours as it takes to sort all your findings before you make another piece of jewelry. Reread my article and decide which type(s) of organizers you want to use. Then, buy as many of those organizers as you will need to organize your sorted findings. Also, buy a label maker and label each organizer. Going forward, take out only the findings you need and immediately put back any leftovers into the appropriate section of the organizer. Swarovski beads will not tarnish (with the possible exception of vintage Comet Argent color beads). Sterling silver beads will tarnish. (So will fine silver beads, but very slowly.) It's fine to store sterling silver in tiny plastic jars along with a small strip or square of anti-tarnish paper. High karat gold and gold-filled beads should not tarnish if stored in tiny clear plastic jars. Precious and semi-precious gemstone beads should not tarnish. Do you throw away the unused leftover beads, or do you put them in a jar and sort them out as needed? Also, how do you work in a living room without losing everything? I never throw beads away. Since most of my beads are in the hardware/auto parts cases, organized by color, I usually take out the removable rectangular inserts for the colors or beads I think I might want to include in the jewelry design I’m working on. Then, as I choose the specific beads for the design, I put several of each into the wells on my flocked beaded jewelry design board. When I’ve finished making my design, it’s easy to put away the leftover beads because they’re still separate in the beaded design board wells. What's Your Favorite Way to Store and Organize Beads and Jewelry Findings? Thank you for an inspiring article and to everyone who shared their storage ideas. I'm on the hunt for better after misplacing two recent orders for beads and findings. I reordered the items, only to find them a week later. I have some of the storage containers mentioned, but I have to move a stack of containers to get to the one I want and it's annoying. I've been using Chinese takeout plastic containers for larger items (but that's where my misplaced orders were hiding). I love, love, love seed beads and also need to store thread and stringing material. My latest idea is to run wooden dowels across the other armoire door and hang beads in plastic bags using s-hooks. I can have multiple rods and store a large number of beads without using any shelf space. I also plan to the small parts storage containers from Harbor Freight to place all the beads and components I need for a project so I can close the lid, pick it up and put it away temporarily. Their prices are amazing! I love looking at all these options. I've collected beads since I was a kid. I have some in tackle boxes and vintage lunch boxes and some still in their bags. VERY unorganized! And I do have one unit with pull out drawers for my seed beads and quills. I'm going to buy a new label maker. I too use a combination of storage bins and containers. I have quite a few of the clear fishing tackle boxes from Plano. I like the one-sided ones with clear flat tops and adjustable slides. Don't like two-sided bines where you have to flip them. Your beads will get messed up. Buy many of the same ones at once, because they will stack together, if they change the model the new ones fit as well. I also have a lot of the Garage type organizers for screws and tools. Work well and stack great. I like the older metals ones with the hard plastic drawers. They keep their shape and last for years. Sometimes you can find them at garage sales. My storage solution is with the clear screw top bottles and shelves like you would find in a nail salon mounted on the wall. I have these clear bottles sorted by color, etc. All I have to do is look on the wall and be able to pick our colors, shapes, etc. to make my jewelry. Very easy and quick. Thanks, Amber. What do you use the open-shelf cubes for? Do you stack smaller storage containers on them? Hi Helen! Thanks for sharing your tip about Harbor Freight as another source of storage containers. I'm glad to hear that your health has improved! I can understand your challenge regarding organizing your bead inventory. This is one of the areas I find challenging as well. There are several software programs, such as Jewelry Designer Manager, Bead Manager Pro and Craftybase Pro, designed to help jewelry artists manage their bead inventories. I have never used any of them, so I can't recommend one personally, but you might want to take a look at them. They allow you not only to enter all the details you listed but also to upload a photo, if you wish. What I usually do is to my beads (gemstone or otherwise) into small zippered plastic jewelry storage bags and label them. If the bags have a white strip, I'll write directly on the strip. Otherwise, I usually write the details on a small piece of paper and slip it into the bag with the beads. I do the same with findings. 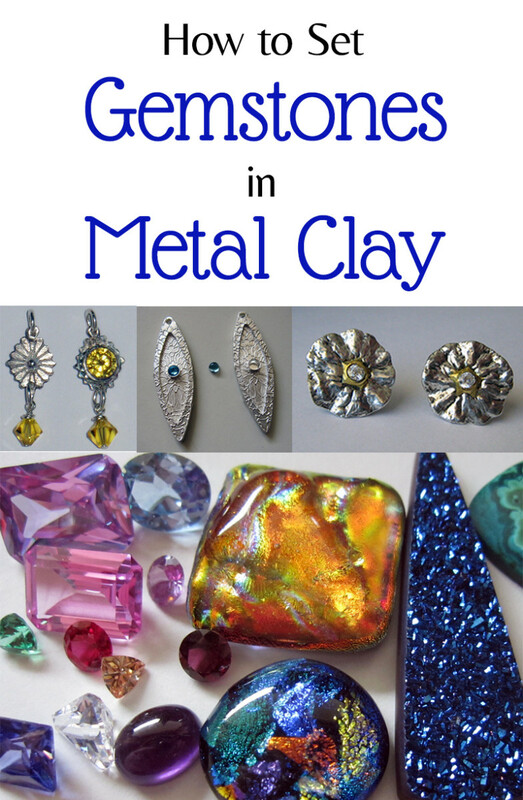 As far as identifying whether a finding or chain is sterling or fine silver versus silverplate, that's not my area of expertise, but a quick Google search on "test silver vs silverplate" turned up several articles with various methods you can try. I hope this information is helpful! Best wishes. Thank you Margaret for sharing your methods of storage tips. I really enjoyed it! Before I ask my question, I want to share my storage containers and where to find them. They are incredibly strong, stackable, see-thru containers. I must say the cost is better than any I've found during my years of collecting all my supplies. Harbor Freight has a vast array of storage containers and I love them because they're sturdy and a large variety. If you don't have a local Harbor Freight near your home they have a web site. I'm going to try to condense my question and explanation so hopefully, I make sense. I have been making jewelry for quite a few years and then became ill in 2014. During that time I stopped making jewelry because I lost my desire. I moved at the end of 2015 and now live in beautiful Arizona. My health has improved and I'm now motivated to get on with my jewelry designs. While I was so ill it didn't stop me altogether because I started buying more beads, findings and such so I'm now overwhelmed with supplies. My problem is keeping track of the bead cost, name of the gemstone and whether it is .925 silver or just silver coated. I've kept a lot of printed invoices that includes a photo of the bead or finding. How do I keep that info so I'm not searching through s huge stack of paperwork each time I make an item? I understand about keeping the colors separate for better organizing but I would like to know how much I paid for the bead when I get ready to price my item for sale. Do you have a solution for determining if the finding or chain is silver or silver-lined? I hope this gives you an idea of my dilemma and I'd be ever so greatful if you can give me some pointers or send me to a website. @The Gem Gypsy, I had never seen (or heard of) the IKEA Trofast storage system before you mentioned them. I really like the fact that you can make a custom storage unit of the exact size and configuration you want. I find that I need bead storage containers that are divided into smaller compartments to keep my jewelry supplies organized. 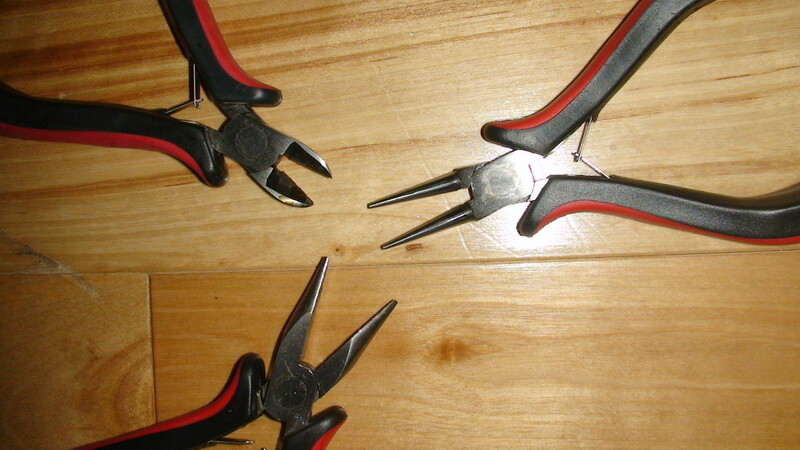 But these might work great for storing jewelry making tools and larger supply items, such as polishing cloths. Thanks for the suggestion! Thank you, Fay @favored! I'm not very organized in general, but if I didn't have a good organization system in place for all my beads and jewelry supplies I'd never be able to find anything! I find that organizing my beads by color family makes designing jewelry so much easier, too. Many thanks for your visit and your kind words! I find the IKEA Trofast units to be great for organizing my large bead collection. The bins are deep enough without being too deep to see everything in them and can easily be divided. They also have lids so when I need to take a tray on the road everything stays in the bin and they can stack. Hi Millionaire Tips, as an adult I became an avid bead collector before I started making jewelry, so I understand how hard it is to resist the many wonderful beads out there! I hope you found some helpful ideas here for how to organize your collection. Once you pick a storage and organization solution and start using it, you'll be amazed at how much more often you will start incorporating beads into your quilt projects once you can easily see what you have by color and size at a glance. Have fun! I've been collecting beads for a few art quilt projects, but so far, haven't used very many of them in quilts. 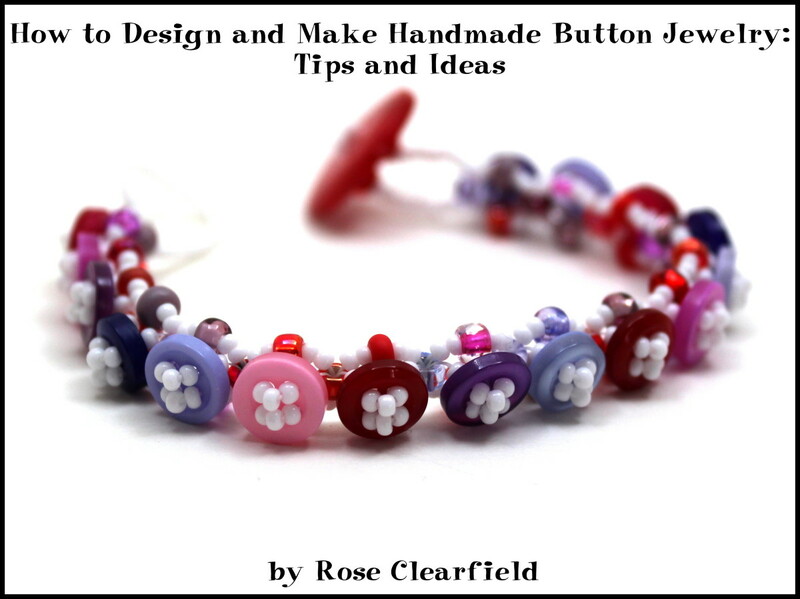 There are so many cute beads out there - it is very addictive just buying them and dreaming about how I will use them. I think I have collected enough now that I need to worry about organizing them so I can find them when I am ready to use them. I am obsessed with craft organizers and these are all wonderful selections. My personal, all time favorite, is my large tackle box similar to the one you have shown. My husband likes to tease me by saying he knows I have about to do some serious crafting when I break out my rackler tackler. (I think he made that name up) I was in Hobby Lobby a few days ago and saw a brand new bead organizer that I really wanted. I had to force myself to step away. Next time I go to HL though, I am taking my 40% off coupon and that dude will be mine! Thanks so much for your lovely feedback, Jacobb9205! I'm delighted that you found it useful. Wow, what a great way to store beads! Voted useful! Thanks very much, Lorelei! I'm so glad these bead storage ideas are helpful to you. It's really fun to buy vintage jewelry to dismantle and then reuse the components in your own designs, isn't it? Thanks again for your wonderful feedback. You have more than a few great ideas listed here. 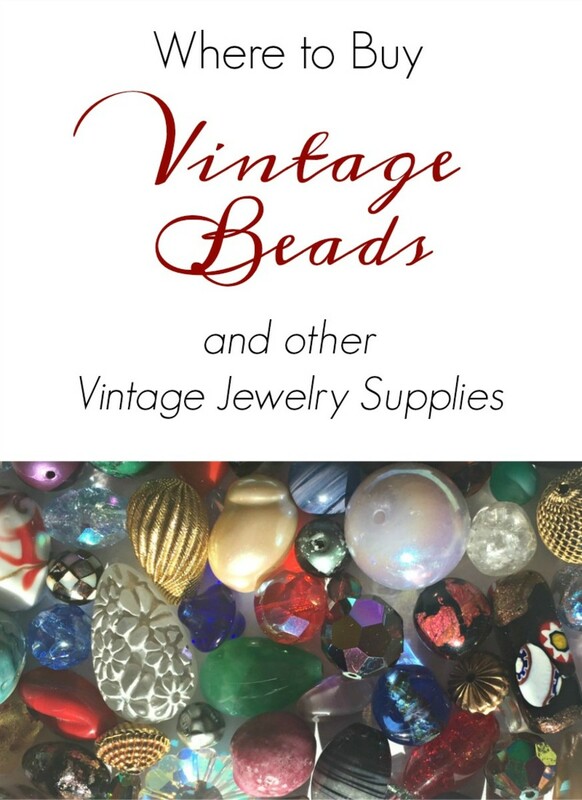 I have picked up quite a few retro bags of jewelry at the thrift store and many of the bead - pearl necklaces need to be dismantled for later use but I haven't organized things yet for this task. This helps. Love the fishing chest idea. Handy for carrying with you on holidays. @Heathersgreatcat, I hear you! I've got a lot of other jewelry making and craft materials that still need a lot of organizing. I'm hoping I can find a solution for them that works as well as my bead storage solutions. Glad you found the article helpful! @AnastasiaNicolaou, thanks very much for your feedback. I'm glad you agree with my recommendations for bead storage solutions! This is really good read on bead storage. We use almost all these storage solutions for beads items. Aesta Mary, thank you for your wonderful compliment! You are very lucky to be doing so much travel, and collecting beads from different countries must be real treasure hunt. I envy you, my friend! Your bead designs are so beautiful and I am sure mostly because you really have the talent but am sure being organized with your beads help as well. I am just looking at the beads I have collected in our travels. I am packing again for the next place and some have to go to my friends here. I wish one day, I can organize them well, too. Wow what great suggestions! I never realized how necessary it would be. There are so many terrific choices you've included. Makes me want to try my hand at it. My daughter used to make some beautiful bead jewelry. She is now busy with her young family but I can imagine that one day she will get back to it again. 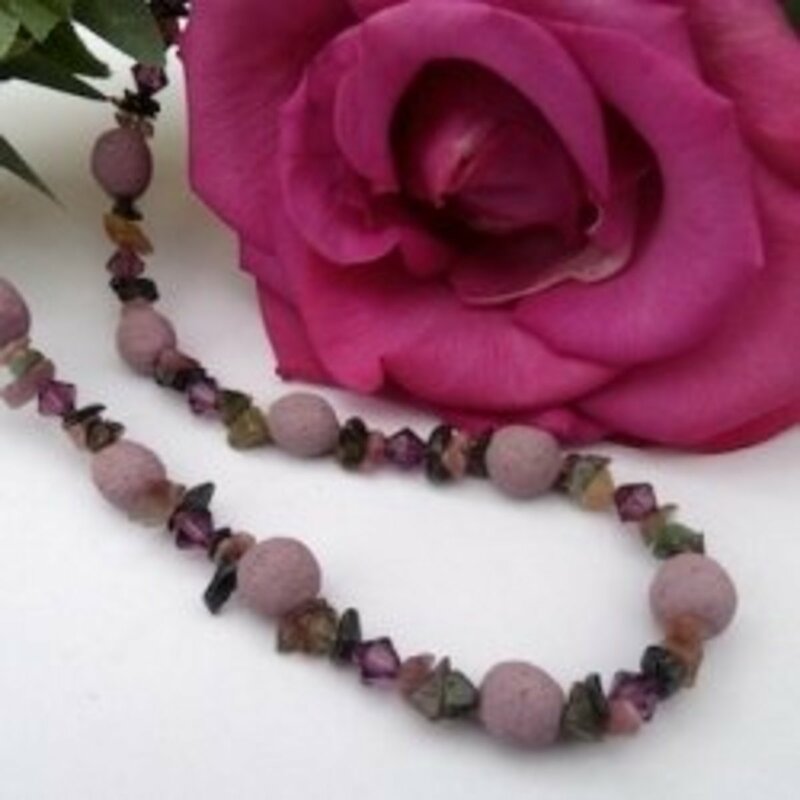 There is just something so romantic and magical about the wide array of colors and styles that beads come in.